People put all kinds of sentimental bric-a-brac in their time capsules: ticket stubs, blueprints to their homes, the bouquet from their wedding, selections of poetry, newspaper clippings from a specific date, records, trading cards, birth certificates, photographs. They may write letters to whom it may concern on the day the capsule is meant to be uncorked, perhaps their children or their children’s children, perhaps their siblings. For filmmaker, writer and erstwhile musician John Carney, the movies are time capsules, and Carney loads his movies with distillations of himself, with Dublin, and in his latest, Sing Street, with memories of the 1980s. This isn’t a nostalgic movie, though. It’s a movie that peers through nostalgia like harsh light through a sheer curtain. Sing Street spins art out of history, but you might mistake it for pop sensationalism at first glance. If so, you’re forgiven. In sharp contrast to Carney’s breakout movie, 2007’s sterling adult musical Once, or even his most recent effort, 2013’s Begin Again, Sing Street aims to please crowds and overburden tear ducts. There’s a sugary surface buoyancy to the film that helps the darkness clouding beneath its exterior go down more easily. Here, look at the plot synopsis: A teenage boy living in Dublin’s inner city in 1985 moves to a new school, falls in love with a girl, and forms a band for the sole purpose of winning her over. If the period Carney uses as his storytelling backdrop doesn’t make Sing Street an ’80s movie, then the mechanics of its story certainly do. You may walk into the film expecting to be delighted and amused. The film won’t let you down in either regard, but it’ll rob you of your breath, too. The boy is Conor (Ferdia Walsh-Peelo). The girl is Raphina (Lucy Boynton). Conor is the youngest child of three, including his older brother Brendan (Jack Reynor), in a family whose patriarch and matriarch (Aidan Gillen, Maria Doyle Kennedy) have fallen on hard times in life and with each other. Raphina is aloof, a model in training with designs on getting the hell out of Dublin and hightailing it to London, just as two-hundred-some-odd-thousand of young Irish folks did throughout the decade. This is a recurring theme of Carney’s work: exodus, specifically from Ireland, a place his cinema views through multifaceted lenses. Sometimes Carney’s Ireland looks beautiful, even magical. Other times it looks downturned and hopelessly backward, a set of iron socioeconomic jaws that chew its citizens up and spit them back out. Cheery, right? Don’t worry: Sing Street isn’t all doom and gloom. It is more often than not neither of these, because Carney’s vision of his characters, his setting and his era is complex in the way that only real life can be. It’s heartbreaking for sure, and brutal on occasion, but it’s also sweet and often unexpectedly hilarious. The film typically operates in the mode of a low-key but charming high school romp as Conor sets about writing, rehearsing and playing songs with his band members, chiefly Eamon (Mark McKenna), a quietly awkward type who happens to be versed in every instrument a good ’80s rock band could possibly need. Better still, he owns those instruments, which is the film’s ultimate convenience. Eamon’s assemblage of gear sets up Sing Street’s musicality, leading into scenes of the gang shooting music videos in the style of the day (including an extremely convincing riff on Duran Duran) and simply getting into the groove of playing together. 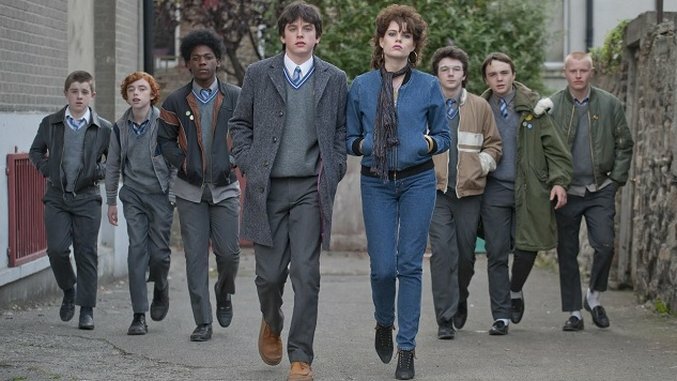 This is where Sing Street is at its most jubilant: in the way it depicts the connective joy of performance. (An early sequence that begins with Conor and Eamon workshopping a song and ends with the whole band playing it in unison is particularly affecting.) Music is the film’s lifeblood, after all, much in the same way that it is Carney’s. Don’t forget that once upon a time, Carney played bass in The Frames, whose frontman, Glen Hansard, starred in the aforementioned Once. If you do, you’ll end up losing sight of Sing Street’s personal touches, or the perception of its personal touches. How much Carney drew on his own experiences to form the “stuff” of Sing Street is questionable. What isn’t is the effect the film’s authenticity has on its appeals to its audience’s emotions. Rather than coy manipulation, Carney chooses to stay genuine. Maybe that explains the casting of unknowns like Walsh-Peelo and McKenna, who know how to sing and how to jam for realsies. If that isn’t enough to justify their casting, then maybe the ease with which they bond on screen is, though Carney’s cast is well considered all around: Reynor and Boynton are especially dazzling, he by virtue of his booming, sly charisma, she because of her understated fortitude and talent for making deflection transparent. (A second act reveal about her character’s upbringing is a subtle jaw-dropper.) They all labor to cover their wounds, inner or otherwise, and to find happiness through sadness by realizing their dreams, however small those dreams may seem at a distance. Sing Street is endlessly charming, a truly uplifting gem, but it earns its charms and uplift through the desperation of failure. When you’re building a time capsule, maybe those are the elements that need to be included most.